Shaving your dog for summer - do or don't? Shaving your dog for the summer – do or don’t? There are several different types of textures on dog’s fur, but in a general breakdown there are two coat types; single coated and double coated. A single coat means that there is only a top (or over) coat that grows all over the body with no different undercoat. Breeds such as Shih Tzus, Poodles, Bichons, for example, are ones with a single coat. These breeds can be shaven generally with the only thing potentially occurring to the coat is over time it may become softer or it may have a slight colour change. Even with only a single coat you want to be careful on when you shave them, especially if you shave them right down, as this, although may appear to feel cooler, leaves the dog exposed to the possibility of sunburn. A dog with a coat shaved right down in the height of summer should not spend any length of time in direct sunlight. With the simple fact that there is only one coat the hair grows back normally and even after a shaving. A double coat means there is both a top (or over) coat made of tougher guard hairs and a bottom or (under) coat that is thick and soft. Breeds such as Pomeranians, Shetland Sheepdogs, Siberian Huskies, Samoyeds, are examples of double coated dogs. With a double coated dog they need to be groomed by brushing throughout the year but most heavily done in the spring when a major shedding period occurs. As the weather warms up the thick undercoat starts to do a complete shed, it detaches from the body and is often described as molting. When you look at a dog in shed, they have “tufts” of fur that is soft and dense peaking through the longer guard hairs of the topcoat, this is called molting. All this dense undercoat needs to be brushed out of the dog or Stage 3 from the top image above occurs. 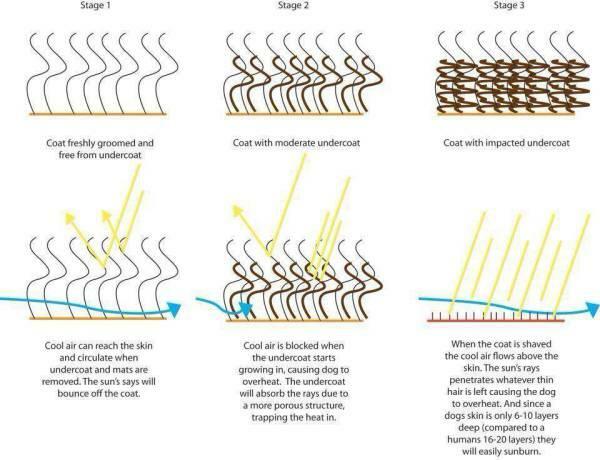 The coat becomes impacted and matted, preventing air from being able to move between the dog’s topcoat and their skin. Once all this undercoat is removed the air can circulate between and through the hairs of the topcoat keeping the dog cool, while the topcoat keeps the skin protected from the sun. This topcoat can also protect the dog’s skin from fly and mosquito bites. The question still remains then, why not shave them and just keep them out of the sun? For one, they may not actually be cool even if they are out of the sun, the topcoat can help to keep the heat off the skin itself and unlike people, dogs do not sweat through their skin. Dogs sweat by panting and in all but northern breeds, through the pads of the feet. Shaving them actually removes some of their natural ability to stay cool. Another reason is that when the hair does begin to grow back it tends to do strange things. For some, it may mean having patches that don’t grow at all, or that don’t grow both types of coat layers (top and under), older dogs often have issues with proper regrowth and then for others (which happens most often) the undercoat grows in faster than the topcoat (since the topcoat isn’t meant to shed extensively it grows extremely slowly) so now that protective topcoat is matted into the undercoat. Dogs like this generally appear as though they have thyroid issues. The hair looks fuzzy and varies in length all over the body. This doesn’t mean the coat will forever stay this way. Most of the time with regular brushing and the next shed cycle the topcoat will get longer while the undercoat sheds away, eventually leaving the coat the way it once was with long topcoat guard hairs and a thick shorter undercoat. One other thing to note about those topcoat guard hairs – they actually prevent the dog from getting wet. Due to the coarseness of the guard hairs water rolls off of this topcoat keeping the undercoat dry, which in the winter is important to keeping the dog warm and dry. All of this being said there may be times where it is necessary to shave a double coated dog. In surgical/medical situations the coat must be shaved or if the undercoat has become so matted it can not be combed out, shaving is the only solution. Once the coat begins to grow in, keeping them brushed and free of matting will prevent the need to shave them in the future. The ideal situation: Keep the hair brushed, remove all the undercoat and allow the dog to remain with their natural ability to keep themselves cool and protected from the sun and some bug bites in the summer and warm and dry in the winter.